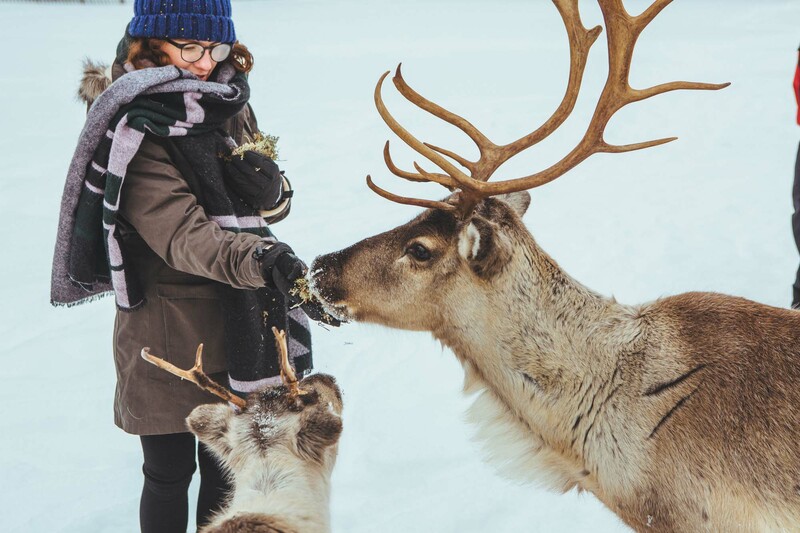 Visiting Lapland in wintertime is like stepping into a fairytale, filled with beautiful creatures amid an endless snowy forest. 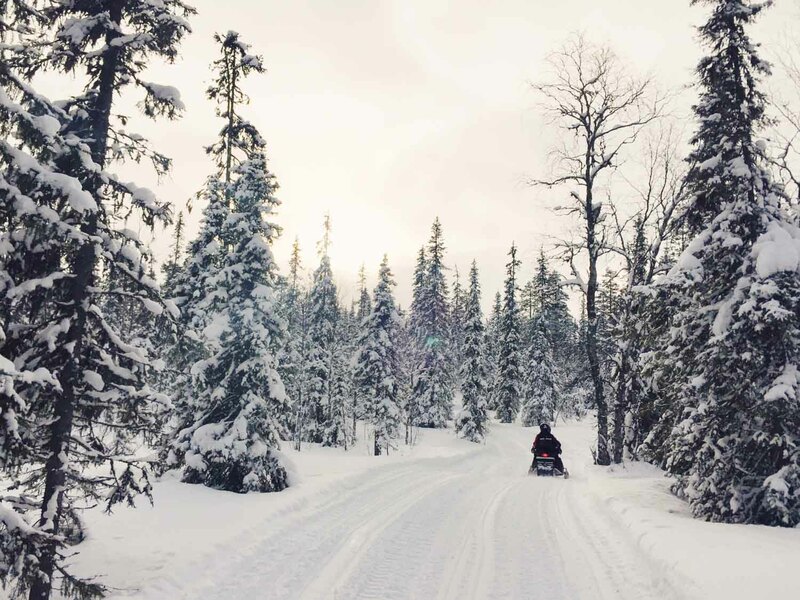 From riding in a sleigh drawn by reindeers to speeding round the trees on snowmobiles, there are many adventures to be had. We went to Finland, like many people do, in hope of seeing the Northern Lights. But, like with our trip to Iceland, we made sure that we planned a Finland holiday that would be satisfying with or without the aurora – it’s not a phenomenon that can be counted upon. We had four nights in Finland, which was enough time to fit in lots of the best things to do in Lapland. The post has all the details of our trip, including costs, accommodation, Northern Lights tips, and how to make the most out of four days in Finland even if you don’t see the aurora. If you want to see the Northern Lights in Finland, it’s best to go up north to Lapland. The aurora can sometimes be seen in the south, but that is very rare (only about 10-20 nights per year). The further north you go, the better your chances are. 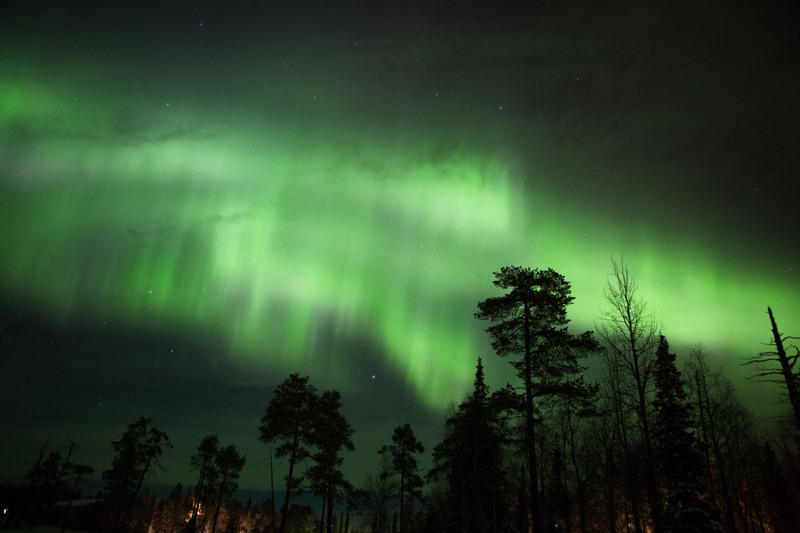 I’ve written a full post here with tips on how to see the Northern Lights in Finland. The capital of Lapland is Rovaniemi, also known as the home of Santa Claus. However, if you want to see the Northern Lights, it’s best to stay somewhere outside of the city, away from all the light pollution. There are many destinations to choose from, ranging from individual hotels to little towns. 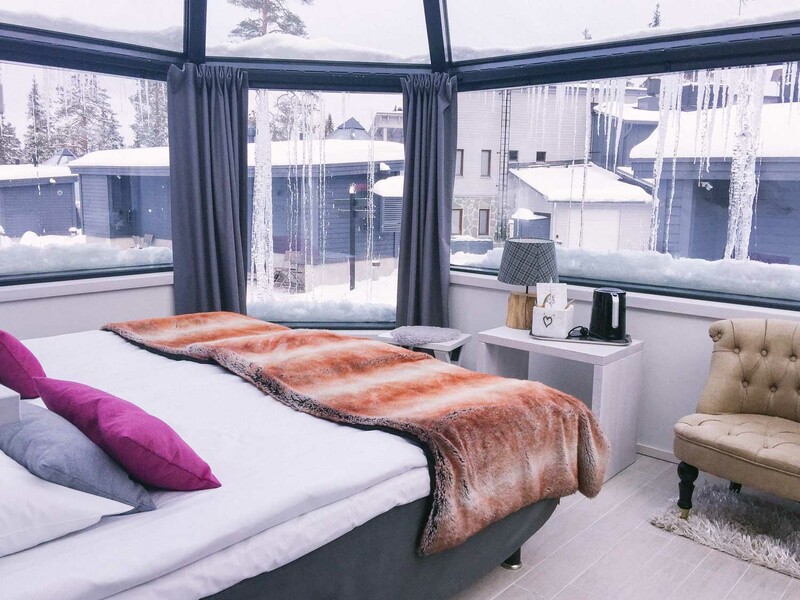 We chose to stay in a small resort town called Luosto as it had a good combination of factors: lots of things to do nearby, including skiing, husky safaris, visiting an amethyst mine, and skiing; very little light pollution; and the opportunity to stay in a glass igloo. 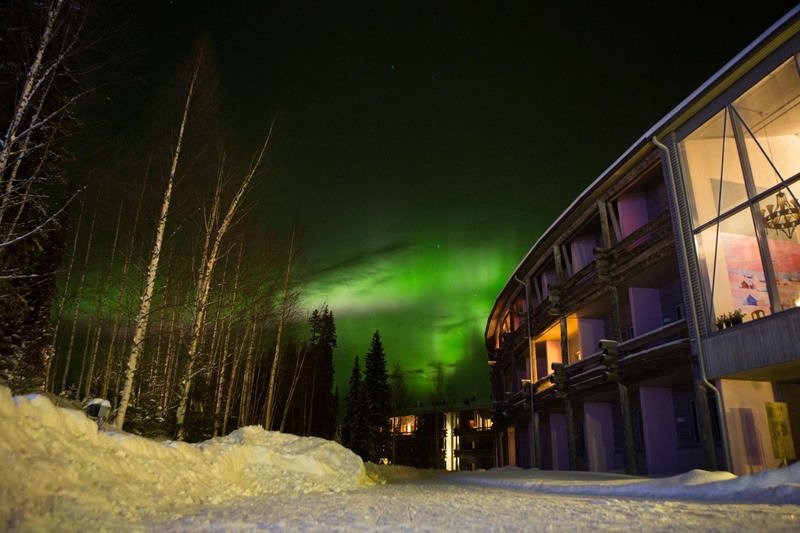 Other popular options include Levi, Saariselka, Yllas, Hetta, Lainio, Inari and Kemi, and Kakslauttanen Arctic Resort. The main airport is Rovaniemi, which serves both domestic and international flights. There are five more domestic airports you can choose from, depending on which place you choose to visit. We flew to Rovaniemi, which was about 1.5 hours from Luosto. There is a public bus (the Ski Bus) from Rovaniemi to Luosto, but we decided to hire a car from Sixt. All cars have winter tyres and we don’t think there’s any need for a 4×4. We found driving here a lot easier than in Iceland because the temperature was more consistent, meaning the snow didn’t keep melting and turning to ice. That said, you still need to be careful as roads will be more slippery than normal if you’re from a warmer country. The roads are really quiet, and easy to navigate as there are so few of them. We went to Luosto, in part, because we wanted to stay in a glass igloo for at least one night and they have these at Santa’s Hotel Aurora. 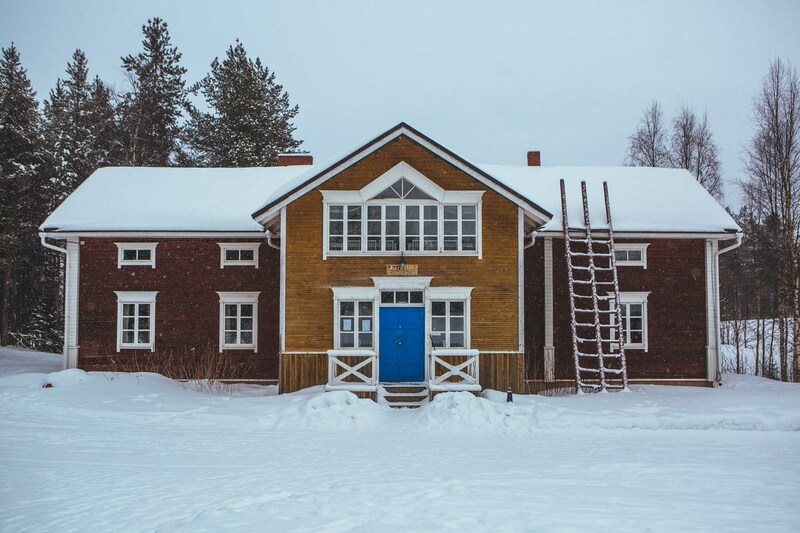 It’s expensive (£580 per night) so we only did that one night and spent the other three at Lapland Hotel Luostotunturi in a standard double room that cost just £100 per night. Lapland Hotel Luostotunturi is used by lots of big tour groups and lacked the creativity/intimacy/individuality that we normally seek out, but this was more than made up for by the price and location. We could walk to a prime Northern Lights viewing spot in just five minutes from our room. In fact, on the night the lights appeared, we could see the aurora from directly outside our room. The hotel was also perfectly located for all the activities we wanted to do. You could easily stay here without hiring a car as there’s a bus from the airport and most other things are in walking distance. 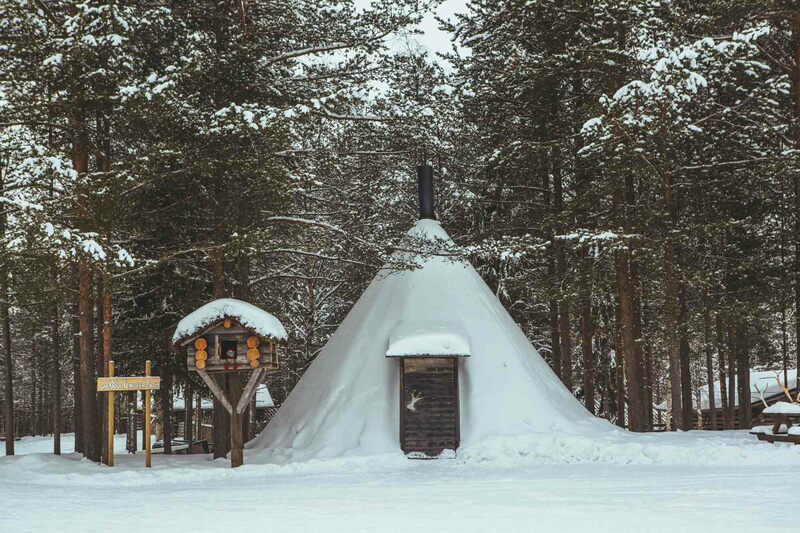 Lapland Hotel Luostotunturi also has log cabins that are more expensive, but come with their own sauna. The hotel also has a spa, but this isn’t something to get too excited about – the small swimming pool tends to be filled with children and and the jacuzzi was cold on the day we tried it. But there was a sauna and steam room, which we enjoyed. As for the igloo at Santa’s Hotel Aurora, it was a wonderful experience, but I’m not sure it warrants the huge price tag. It would definitely be worth the money if you saw the Northern Lights – it’d be amazing to watch them from the comfort of your bed – but it’s more than likely you won’t see them. The night we stayed there it was completely overcast. The igloos are also quite close together, so unless you’re on the end of the row, you won’t get the desired feeling of being surrounded by forest, and will instead be looking out at the other igloos/the hotel. I would definitely recommend requesting an igloo at the end of the row as that would enhance the experience ten-fold. 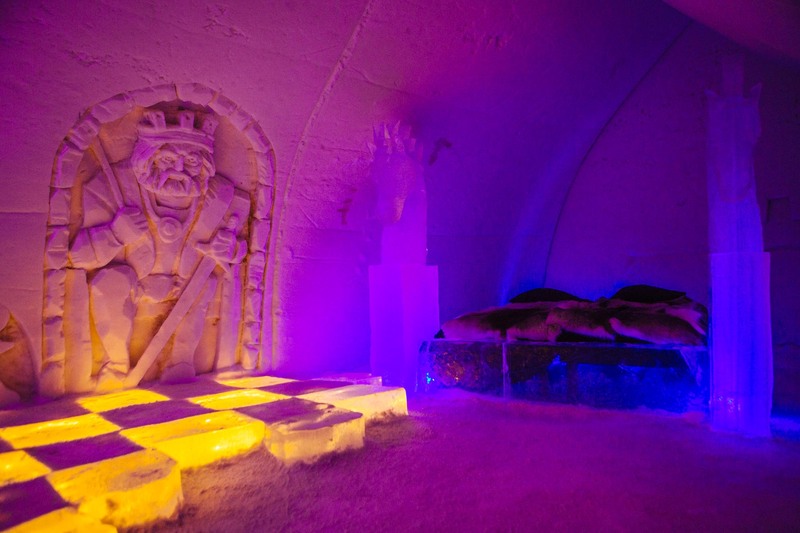 Essentially, paying to stay in an igloo is a gamble. Without the Northern Lights, the igloo is a beautiful place to spend the night but perhaps not worth £580 – but with the Northern Lights it’d be incredible and likely worth every penny. Both hotels we stayed in offered an aurora alarm (a little phone that they sent a message to if the aurora appears). This service was offered until 1am after which time you had to start checking yourself. 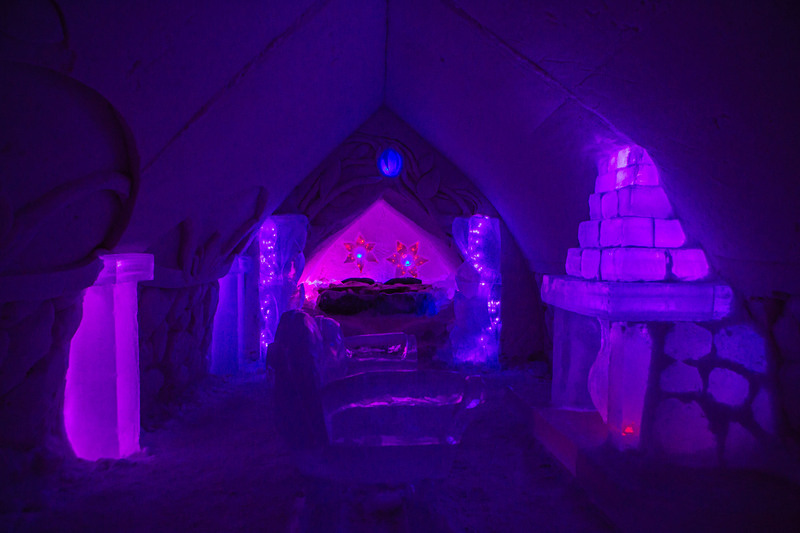 Accommodation: £100 per night at Lapland Hotel Luostotunturi and £580 for a glass igloo at Santa’s Hotel Aurora. How is Finland for vegetarians? As with many Nordic countries, Finland isn’t great for vegetarians. It’s good in the cities, but when you get to the countryside, the options diminish. We stayed in hotels that included a breakfast buffet, which had plenty of vegetarian options. We made sandwiches out of the buffet for lunch, so that covered two meals per day. In the evenings in Luosto, we ate in the hotel restaurants. The options were few but good (soups, pizza, veggie burgers, mushroom blinis, and risotto) and we were satisfied, but if we’d stayed any longer than four nights, we might have started to get a bit bored of the choice. I can’t say this enough: it’s really important that you don’t pin all your hopes on seeing the Northern Lights. For example, out of the nine nights we spent in Northern Lights territory this year, we only saw them on one night. However, even if we hadn’t seen them at all, we’d still have been happy with our trips to both Iceland and Finland. 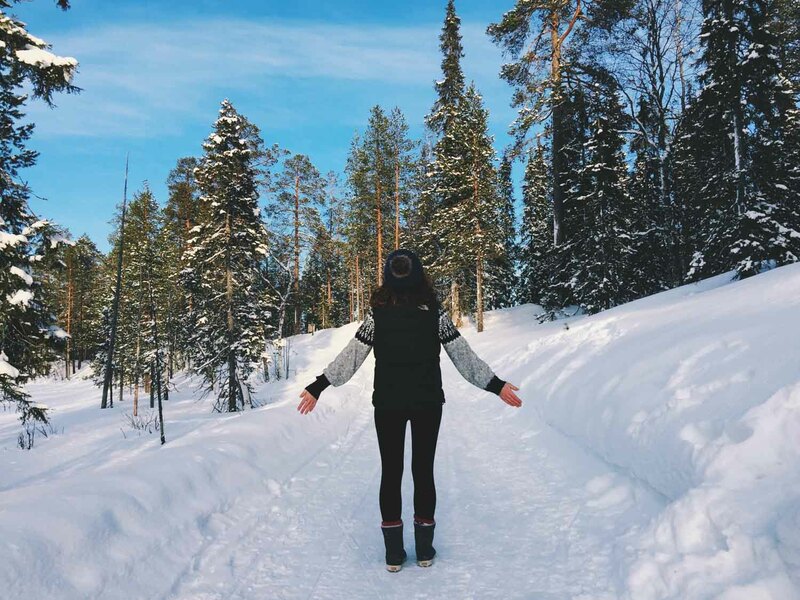 There are plenty of fun things to do in Lapland to keep you satisfied. Depending on your priorities, you could coincide your Northern Lights hunt with a ski trip, a family holiday to see Santa Claus, or a winter holiday enjoying the best of Lapland. 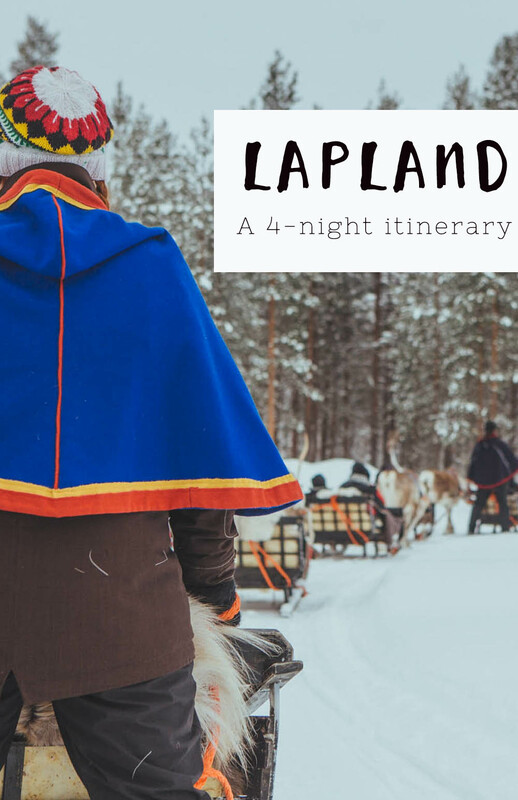 The itinerary I’ve put together falls into the final category – a ‘best of Lapland’ experience. It’s worth trying to maximise the amount of nights you spend in Finland to up your chances of seeing the lights. Sometimes I advise getting an early morning flight on the day of your arrival or an evening flight on the day of departure to avoid paying for an extra night of accommodation, but in this case, I’d definitely do what you can to fit in as many nights. We arrived into Rovaniemi in the late afternoon and immediately picked up our rental car from the airport and drove to Luosto. We don’t have much time after we arrived so just went for a walk, had dinner, and tried our luck at seeing the aurora. Unfortunately that night was completely overcast so we didn’t see anything. We repeated this every night, trying our luck with the Northern Lights. 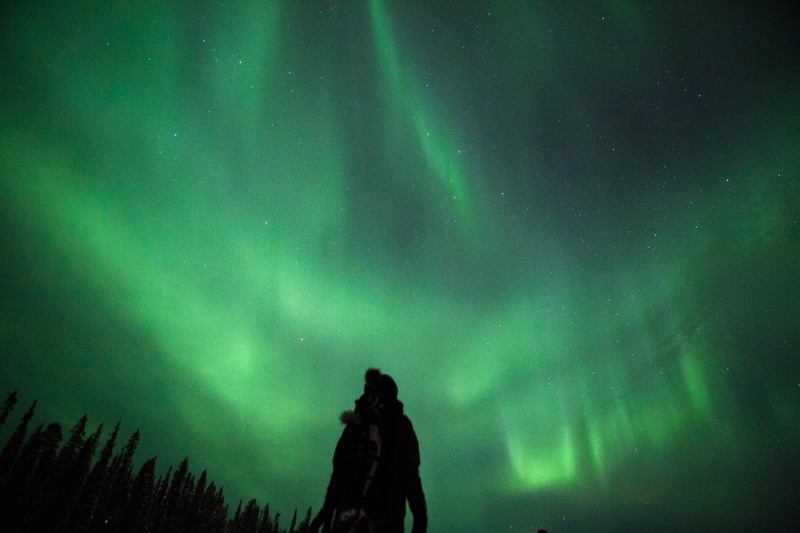 The whole ritual of checking the weather and aurora forecast and then staring up at the sky, often willing the clouds to disperse, is part of the aurora hunting experience. Just bear in mind, most nights might not be fruitful. One of the best things about taking a Northern Lights trip to Finland is that you have the opportunity to combine it with a skiing holiday. 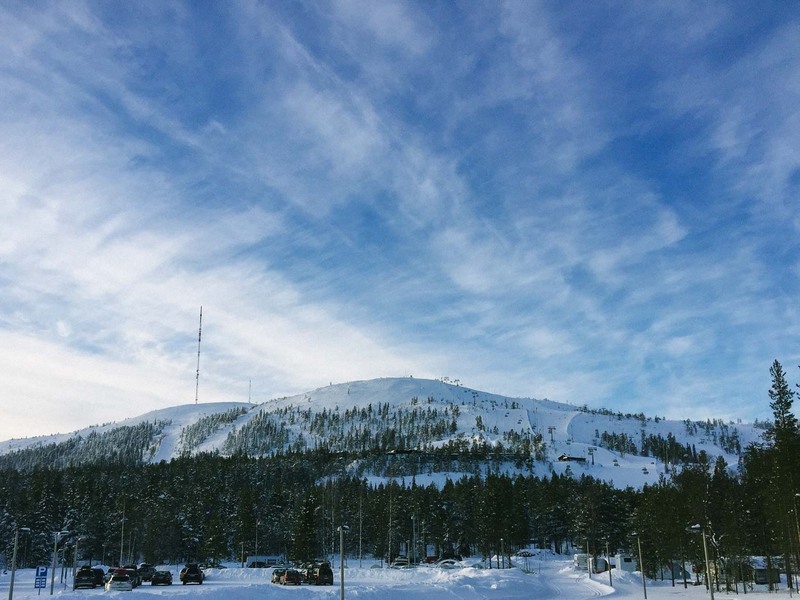 There are lots of ski resorts around Lapland and we had two on our doorstep in Luosto: small ski resort in Luosto itself, and then a slightly bigger one down the road at Pyhä. 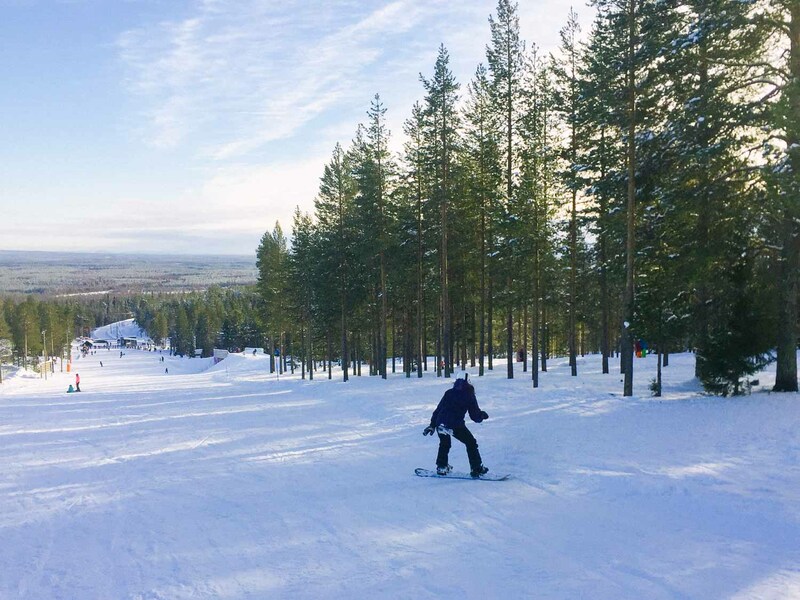 We went to Pyhä Ski Resort, and I can vouch that it’s a great place for beginners – this was my first time on the slopes! I opted for snowboarding as that’s what Steve does, and I had a 90-minute private lesson with one of the instructors from the ski school. My teacher, Vesa, was brilliant and managed to teach me the basics pretty quickly. I then spent the next few hours practising with Steve. It was brilliant fun, and I’m now dreaming of my next opportunity to snowboard – I think I’m hooked! As well as being good for beginners, Pyhä has 14 slopes suitable for a range of levels, including blue, red and black. I only used the simple T-bar lift, but the resort has fancier chairlifts for the higher slopes. A lift pass costs £36 for the day, and it’s £23 to rent a snowboard, and £16 to rent boots. There are also lots of places to stay in Pyhä if you’d like to base yourself there. It was on day two that we saw the Northern Lights. 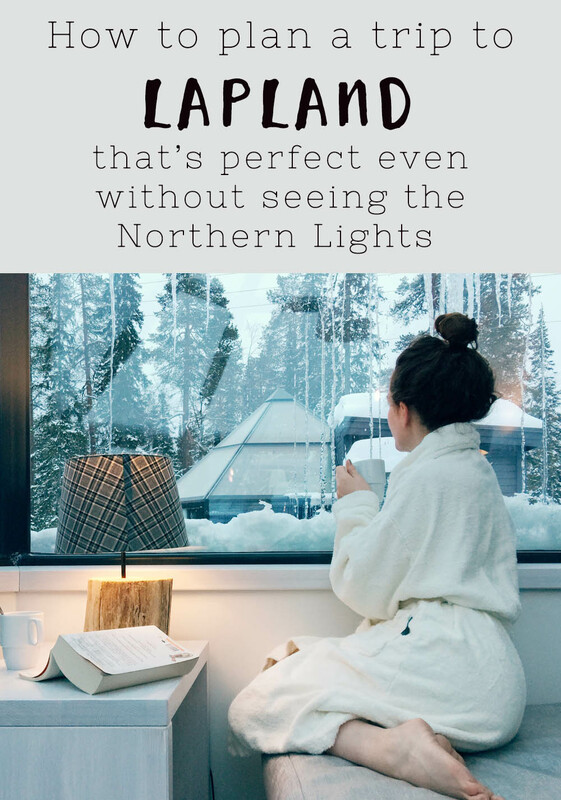 I’ve written all about it in this post, which also has lots of tips for seeing the Northern Lights. In short, it was incredible, and goes down as one of the best things I’ve ever experienced. We didn’t go on any sort of special tour to see the lights, but simply walked down to the middle of the frozen lake beside our hotel. 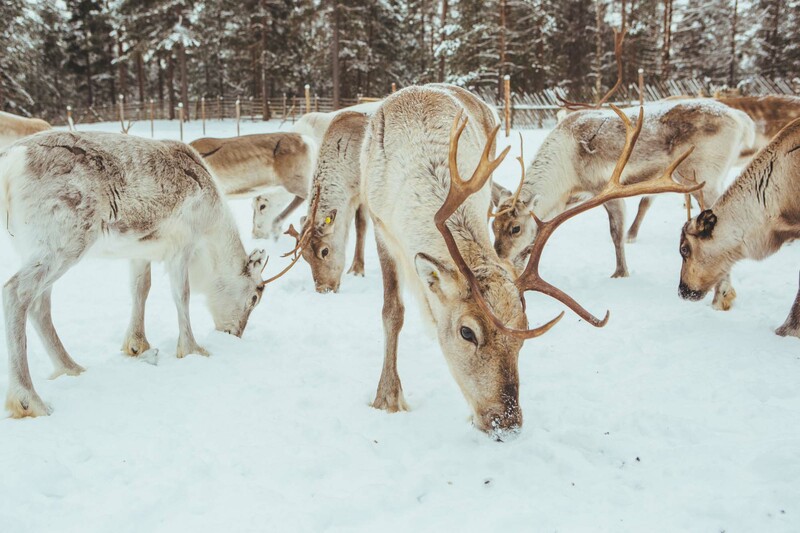 Reindeer are an iconic part of Lapland, adding to its fairytale image. 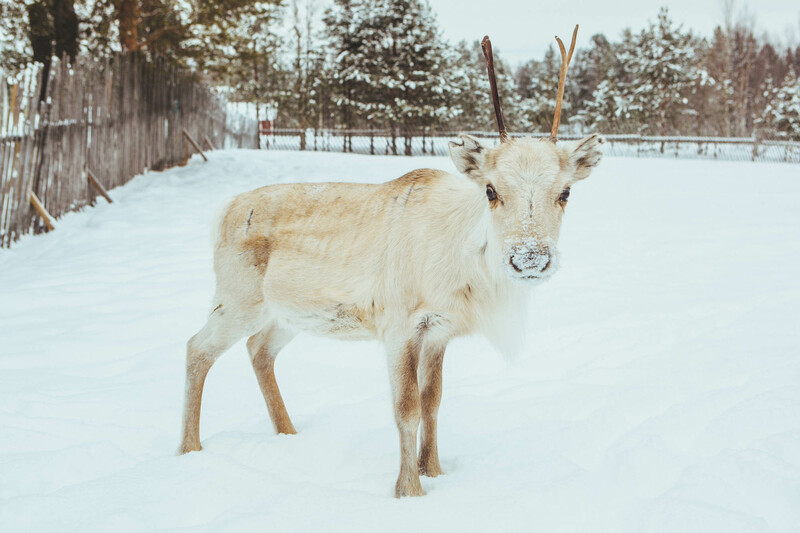 They’re beautiful creatures, and we enjoyed a lovely morning visiting Jaakkola reindeer farm. 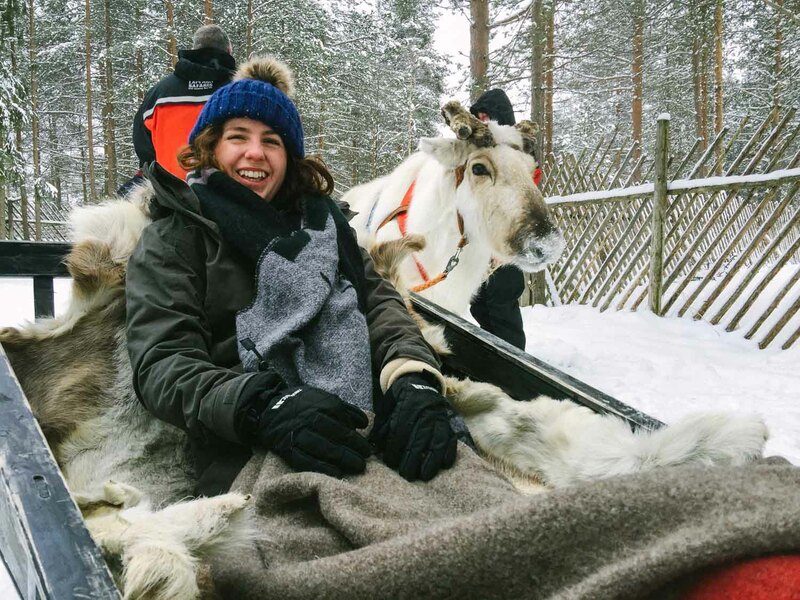 The visit included a 20-minute sleigh ride, the opportunity to feed the reindeer, and a short presentation about the reindeer, the farm and its history. This would be a particularly magical thing to do with children, although us big kids loved it too. 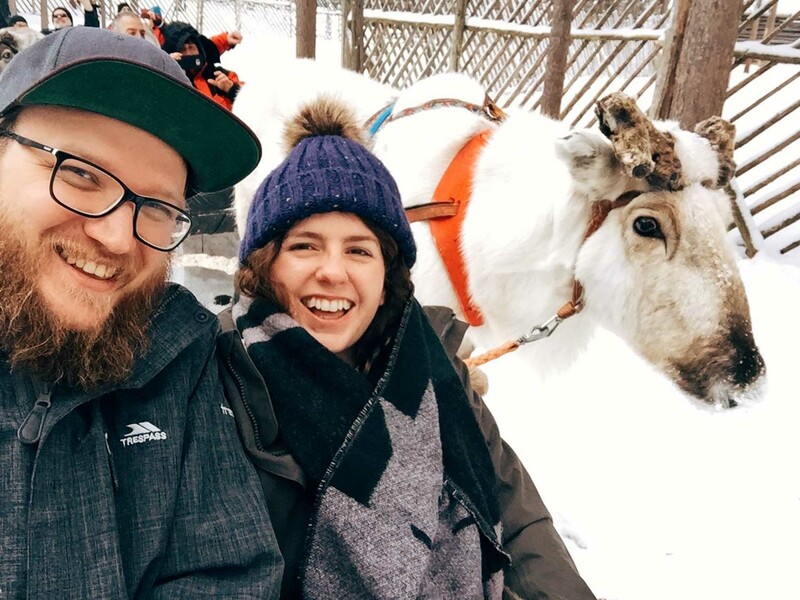 Jaakkola Reindeer Farm offers a few different packages, but the one we did cost £43 for 1.5 hours. It’s also possible to combine it with a snowmobiling trip. Luosto is home to the Lampivaara amethyst mine where you can go and hunt for your own special gem. It’s in an incredible location, high on a hill surrounded by forest, and it’s the only amethyst mine in Europe that welcomes visitors. We went there by snowmobile as part of a trip with Lapland Safaris. Steve and I had a our own snowmobile and it was a thrilling ride, whizzing through the forest. The guides gave us a short driving lesson beforehand and then Steve and I took it in turns to drive. You have to have a full driving license if you want to drive one. Unlike in Iceland, these snowmobiles had heated handles, which was an amazing addition – in Iceland our hands froze even in double-layer gloves! The mine is also fun to visit: we listened to short talk about amethyst and the history of the mine and were then let loose to try and find some treasure. It was more difficult than anticipated, but Steve and I both found some amethyst, which I now consider my lucky stone. 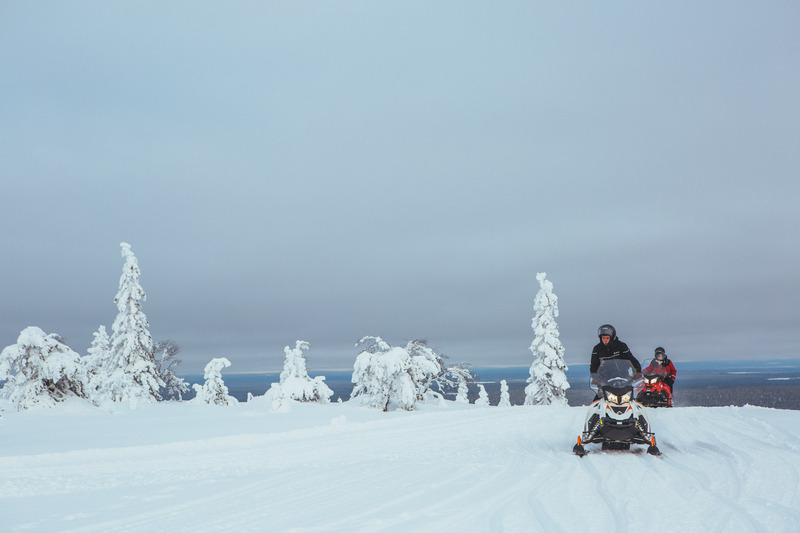 If you don’t want to travel by snowmobile, there’s also a little snow train that takes visitors to the mine, picking you up in Luosto, Ukkoluosto parking lot, or Lampivaara Café. Our trip, including snowmobile hire, plus entry to the mine, cost £97 each, and lasted two hours. We were also allowed to take back one piece of amethyst each. 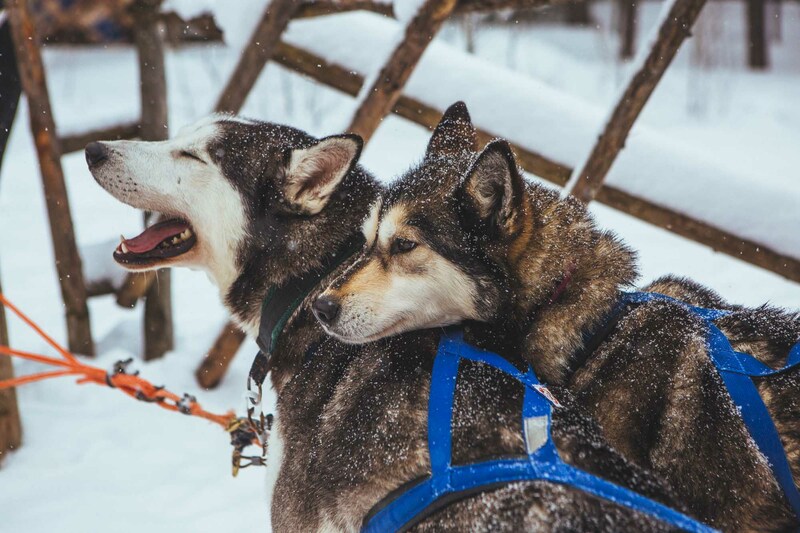 A absolute “must do” on our Lapland wish list was going on a husky safari. We’re both huge dog lovers and huskies are one of our favourite breeds. Even just going to see some huskies would have been exciting enough, let alone driving a husky sleigh. 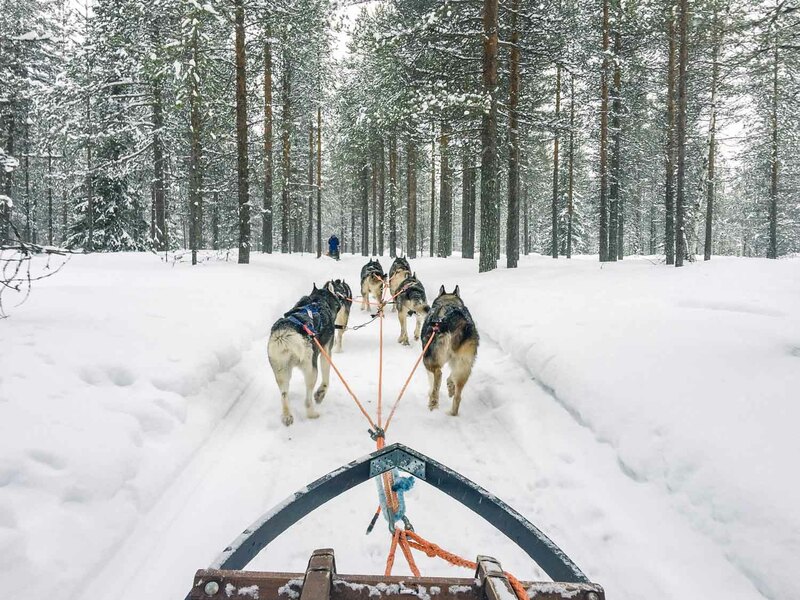 As it was, we did both and spent a beautiful morning meeting the huskies at Korvalan Kestikievari and then driving our own sleigh through the forest, pulled by a team of eight dogs. Steve and I took turns driving while the other sat on the sleigh. It was an incredible feeling, navigating the forest by such ancient means – the perfect antidote to city life. The husky farm we visited, Korvalan Kestikievari, is a family-run business and the care and love the animals receive is obvious. We had heard horror stories of animals being treated badly at some husky farms in Finland, so it was heartening to see how well run this place was. There are a number of different husky safari options on offer, ranging from just 0.5km to 45km. We opted for the 8km ride, which included about 40 minutes driving, plus 20 minutes for the driving lesson, which cost £69 each. Driving the sleigh was a lot easier than it first looked. 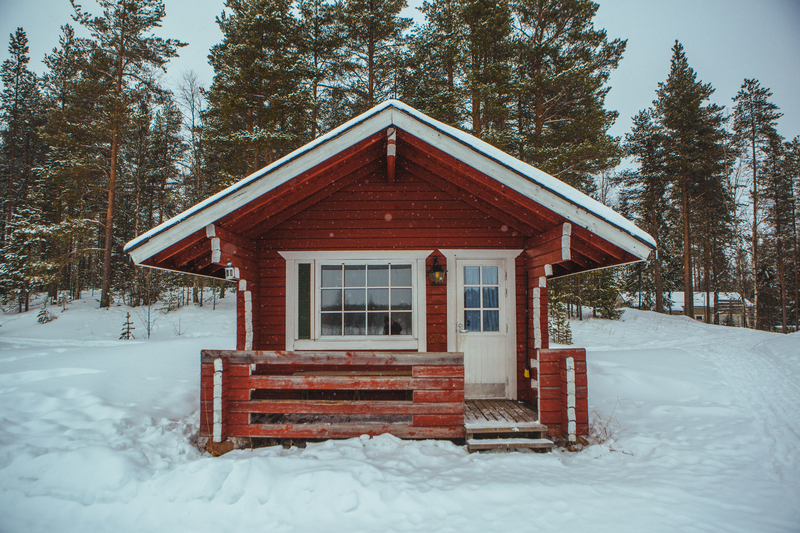 You can also stay at Korvalan Kestikievari – they have a lovely set of cabins overlooking a lake and offer a full programme of activities, including reindeer visits, snowshoeing, ice fishing, and more. It would definitely be a lovely place to base yourself in Lapland. The main house where meals are served is a beautiful historic building, which has been in the family for years – they’ve been offering accommodation here for over 100 years. On our final night in Lapland, we went on our final Northern Lights hunt. This time, we decided to take a tour and combine it with some snowshoeing. This has the advantage of taking you even further away from the light pollution in Luosto, which up your chances of seeing, and improves your view of the lights. Unfortunately, the night we went was completely overcast and we had no chance of seeing the lights – it was particularly unfortunate as the KP forecast for that night was 5 as there had been a solar storm. Alas, such is the way with aurora hunting. 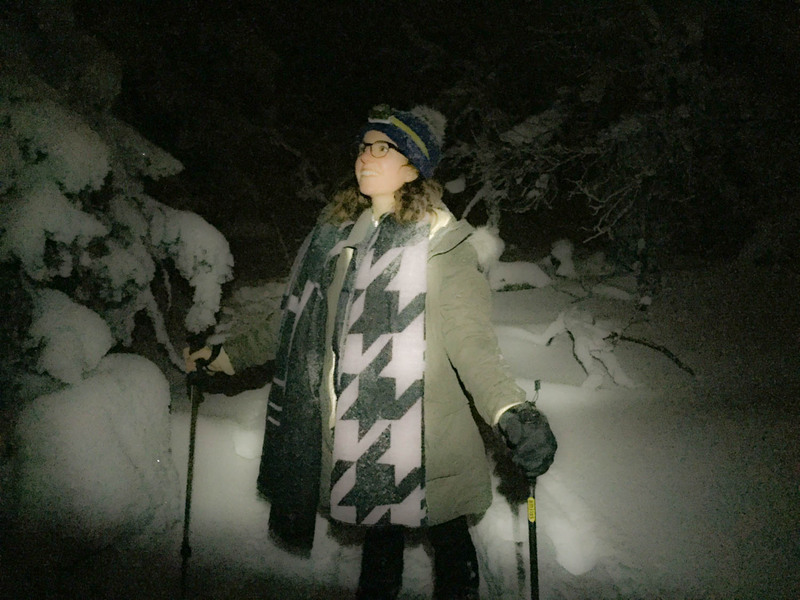 And despite not seeing the lights, we still really enjoyed our snowshoeing trek through the forest. It was a really peaceful experience, walking through the forest at night – our guide took us up the fell behind Luosto town and we weaved in and out between the trees, stopping midway for some hot berry juice. I hadn’t tried snowshoeing before, and while it felt quite cumbersome at first, I soon got used to it and found a rhythm to the method. We were going uphill, so it was quite taxing on the legs – I certainly felt it the next day! The snowshoe trek with Lapland Safaris cost £57 each and lasted about two hours. On our final day, we decided to stop by an ice hotel en route to the airport. It was beyond the airport so we had to double-back on ourselves, but we had the time so we went for it. 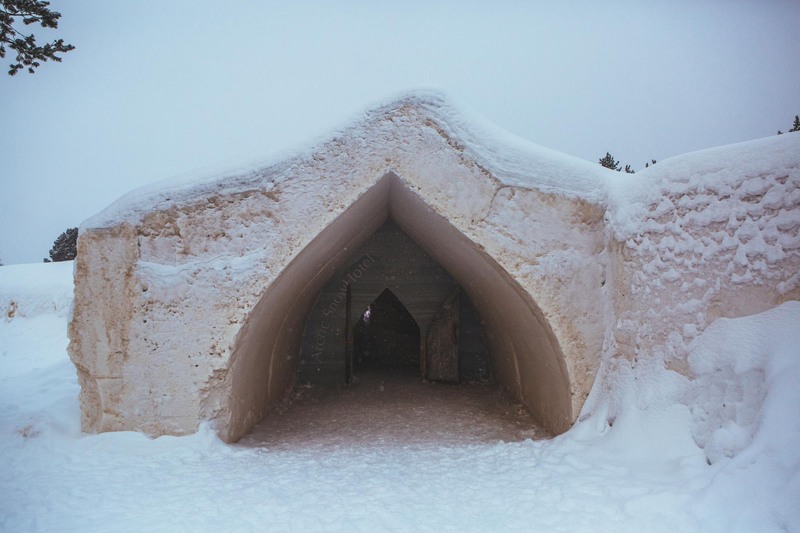 Actually staying in an ice hotel doesn’t really appeal to me, but I was curious to see what they’re like and the Arctic Snow Hotel allows visitors during the day. You can also go there for dinner at the ice restaurant or drinks at the ice bar. It was fascinating to see the hotel, especially the suites, which are designed by artists and come in lots of technicolour designs. 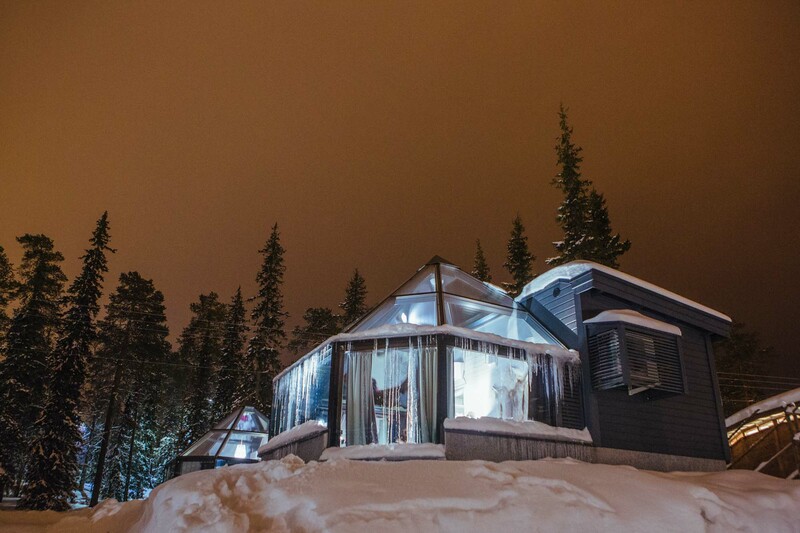 There’s also a snow sauna on the site, which you can pay to visit even if not a guest. 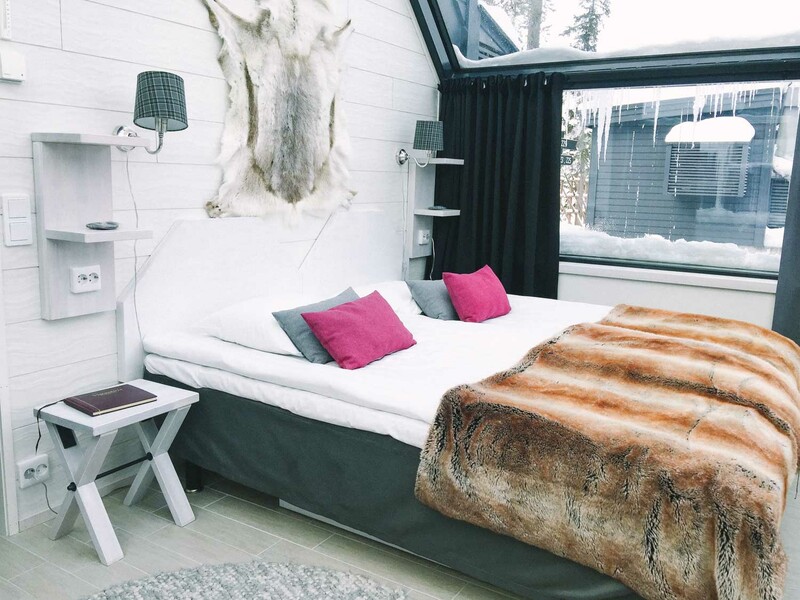 If you want to stay in the ice hotel, it costs from €130 per person per night. They also have glass igloos on offer, from €499 per night. To visit costs €49 including a tour and transfer from Rovaniemi. Let us know if you have any questions, or if you have your own tips to add. Book your car rental with Rentalcars.com. They always have the cheapest deals. And don’t forget your travel insurance! We recommend World Nomads who offer reliable, comprehensive cover, including medical, evacuation, baggage and a range of adventure sports and activities. You can buy World Nomads insurance even when you’ve left home, which is unusual for travel insurance companies. If you’re planning a trip, be sure to check out our travel planning pages. 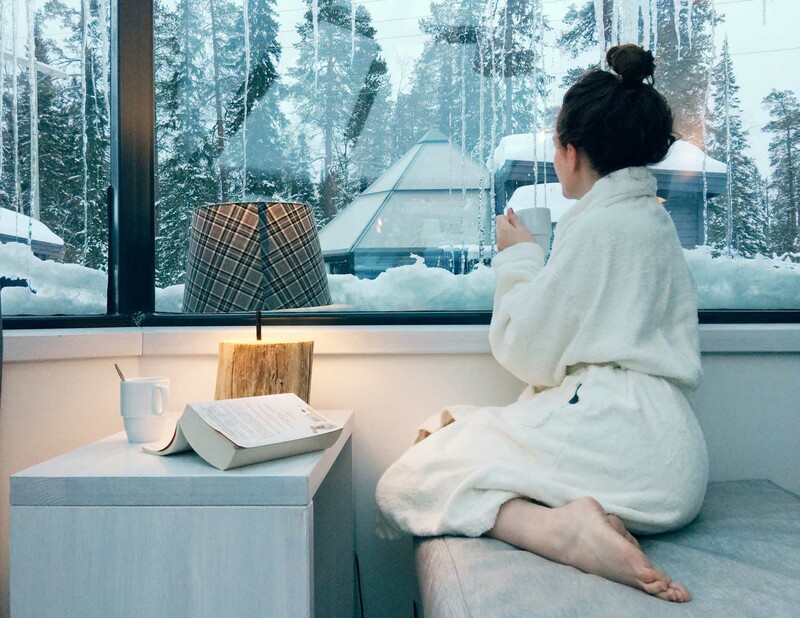 We also have full, detailed itineraries for How to make the most of 5 days in Iceland in winter; How to relax in Goa and Kerala; The ultimate South Africa honeymoon guide; How to make the most of 10 days in Japan; Finding hygge in Copenhagen, and 48 Hours in Dublin. See all our itinerary posts here. Disclosure: We went to Finland partly in partnership with Visit Finland and Visit Luosto. However, we also added some extra activities in addition to what they suggested. As always, we only did things that we’d choose to do with or without a partnership opportunity. 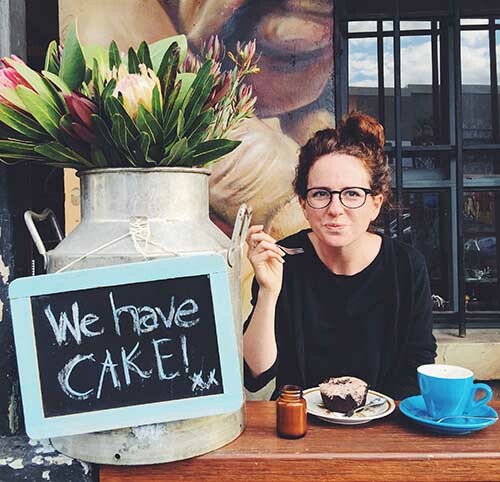 Creating partnerships is one of the ways I make this blog sustainable. In no way did it sway our opinion. I’m continually frustrated by the lack of honesty on the internet, so I’m definitely not going to add to it! Such beautiful pictures! I’m glad you managed to see the Northern Lights in the end – I’d love to see them myself one day too! I’m actually from Finland, but as I’m from the Southern part I’ve never been to Lapland. I’d love to visit it one day though as it seems like a completely different place from where I’m from. You guys are so lucky to see that mesmerising Northern light. Finland is beautiful, indeed. Seems like this itinerary has a lot of fun. Thanks for sharing. I love the look of the second hotel with that big window! What a lovely trip 🙂 One day I’ll get to the Northern Lights. Everything is great except for the £580 for one night stay in the igloo. I’ve always wanted to visit Lapland and stay in one of those, but this is so expensive. However, I’m sure it’s an awesome experience. Oh my gosh, it all looks so gorgous! Finland is rapidly climbing up my travel wishlist. It looks like just my kind of travel. The lights, the dogs, the reindeer! I used to see the Northern Lights all the time in Quebec, and, oddly enough, Wisconsin, but they weren’t as…concentrated (?) as they seem to be in those Northern European countries. It looks so enchanting! I’m glad to know that about the igloos, though. I’d hate to spend so much and be so close to the other igloos. 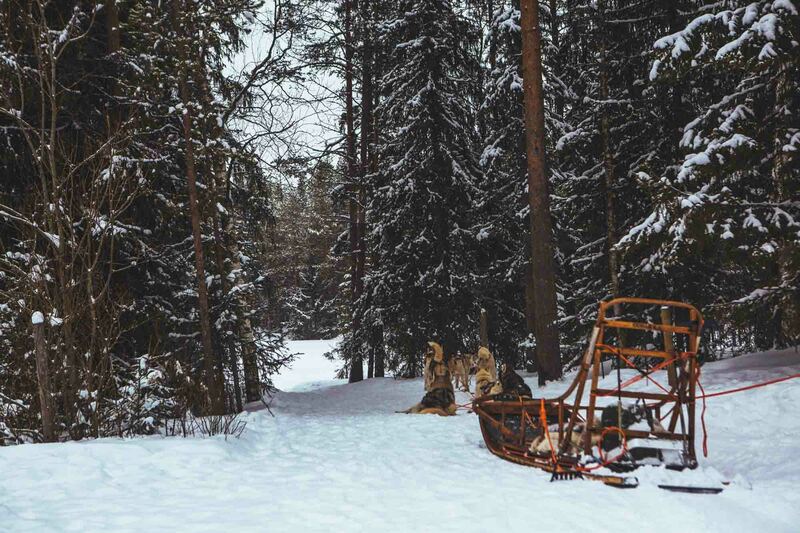 These pictures are making me want to put on snowboats and head to Finland. I never really thought about Finland if I’m honest. I always thought it to be really cold and expensive for just Northern Lights but reading this made me realise just how much more there is to do there! Looks like you had a wonderful time! To see the Northern Lights is definitely on my bucket list. And the places you stayed look amazing! That sounds like so much fun! I would be so excited to see the northern lights! Were they really as clearly visible as they always look in photos? Wow, what an amazing trip. Thos pictures of the Northern Lights are to die for! Thanks for being so candid with the costs as well, one day I’ll visit and would love to stay in one of the igloos and I’ll be sure to ask for one on the end! What an incredible trip! Your photos are so beautiful, especially of the aurora. And that reindeer farm? Oh my goodness! I pinned this for later; you have definitely inspired me to take a trip for northern lights! This looks so beautiful! I love the green color of the northern lights. I’m going to Helsinki in June, but I won’t be in Lapland. Hopefully next time! 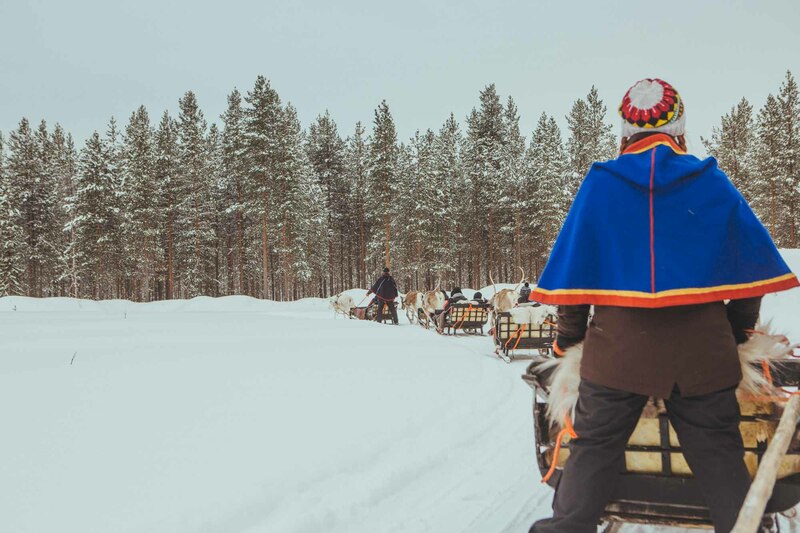 One of the best articles i ve seen about Lapland. The accomodation is absolutely gorgeous! 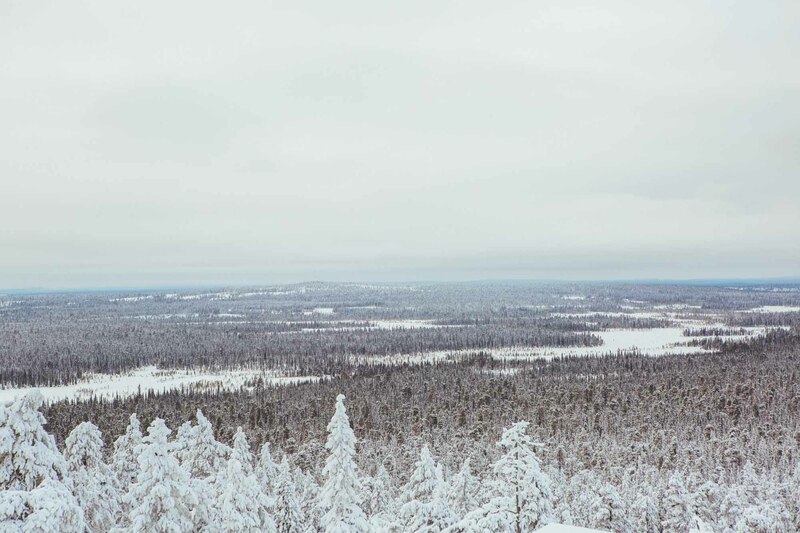 I have been to Lapland on a work trip before, and although the freezing cold weather ( – 20 ) I absolutely loved it! And the fact that the sun went down at 3 pm is just a once in a lifetime experience! It looks like an incredible trip even if you didn’t see the northern lights so good planning on your part. At least you were able to find some veggie options even if they weren’t that interesting. I guess it is kind of expensive but I would have expected this kind of trip to be more expensive than a city break to somewhere else in Europe. You got to see and do so much more cool stuff though. Can I first note that I’m deeply jealous? I spent a lot of time in Norway and made trips to see the northern lights, but I never got to see them. I’ve now got a new target in might sights thanks to this post! Wow doing a dogsled trip and viewing the northern lights was already on my list, but I was thinking in Northern Canada. Now that I live in Europe I definitely need to check out Finland! What a comprehensive guide! Northern Lights are on my bucket list. Hope to visit there soon. Your pictures speak for itself how amazing your entire experience would have been! Awesome, so pleased this was useful. Have an amazing time. And yes, I highly recommend the husky safaris! I’m one of the guides working in Jaakkola farm. I would like to ask is it possible to get some photos of me which you took during your visit? They look pretty awesome! Hi.. appreciate if you could recommend a travel site where I can book all these activities with a better rate.. I found in Lapland safaris site however, I find it so expensive.. thank you..
I’ve already spend my lots of time in norway and made beautiful trips to see the northern lights, but i never goto see them. I’ve now got a new target in might sights thanks to this post! Hi Victoria. Great trip to Lapland! It is an enviable time.I have my plan to go skiing with my friends in the next 2 months but it’s my first time to go skiing. I’m so excited with the trip. By the way, I have to prepare my stuffs for skiing. Thank you in advance for your suggestions. Great article. 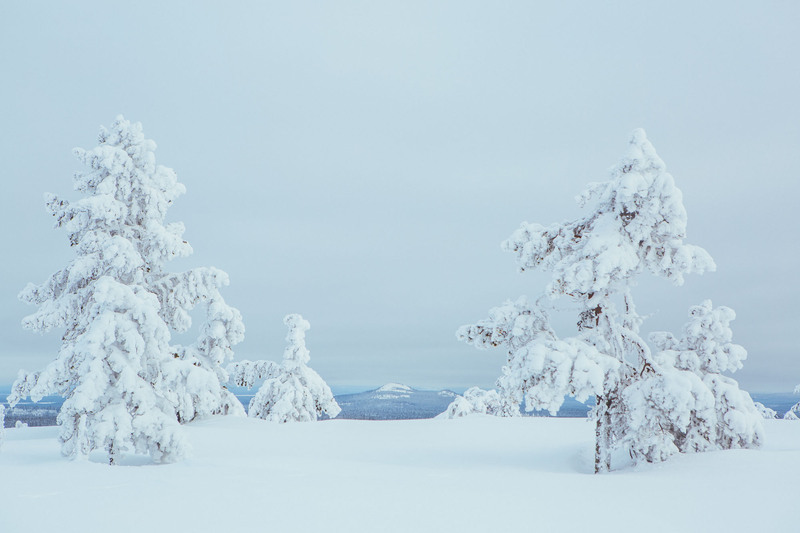 What month did you visit Lapland?